Europe Electric Radiators Market size in 2018 was valued over USD 500 million and the annual installation is set to surpass 6,000 thousand units by 2025. Europe electric radiators market is set to grow owing to rising environment concerns along with the introduction of stringent norms to combat GHG emissions. The European Commission has proposed an energy efficiency directive to launch policies and measures with an aim to support the EU energy efficiency target. Strict regulatory mandates along with the focus toward reduction of electricity bills is projected to complement the business outlook. Introduction of energy efficiency strategies, rapid industrialization and increasing demand for power consumption will positively influence the electric radiators market share. Growing efforts to minimalize the electricity demand and supply mismatch is anticipated to encourage the business outlook. In addition, rising technological funding toward the development of advanced system coupled with the growing implication of energy management and optimization across the industries will propel the product penetration. Convection electric radiators market is anticipated to grow on account of significant rise in demand for energy efficiency along with the rising focus toward reduction in electricity bill. Growing need for comfort & suitable system design coupled with increasing R&D investments accompanied by the improvisation in product features is projected to augment the product adoption. Moreover, rising environmental concerns along with increasing demand for sustainable units will encourage the business growth. 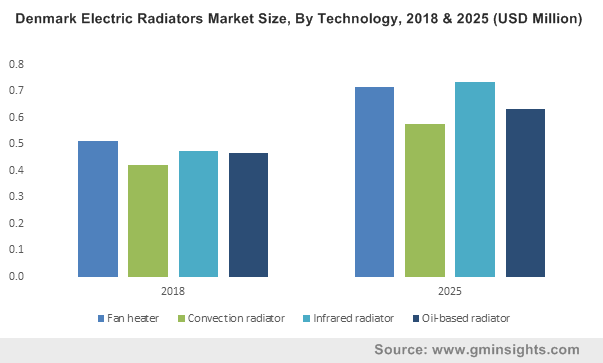 Infrared electric radiators market was valued over USD 120 million in 2018. Silent operations, no fume formation, low energy consumption and zero light are some of the key features escalating the industry growth. In addition, infrared radiators require less maintenance and does not need pre-heating that saves energy. Furthermore, rising demand for efficient, light-weight and compact systems for all application usage is significantly increasing the product installation. 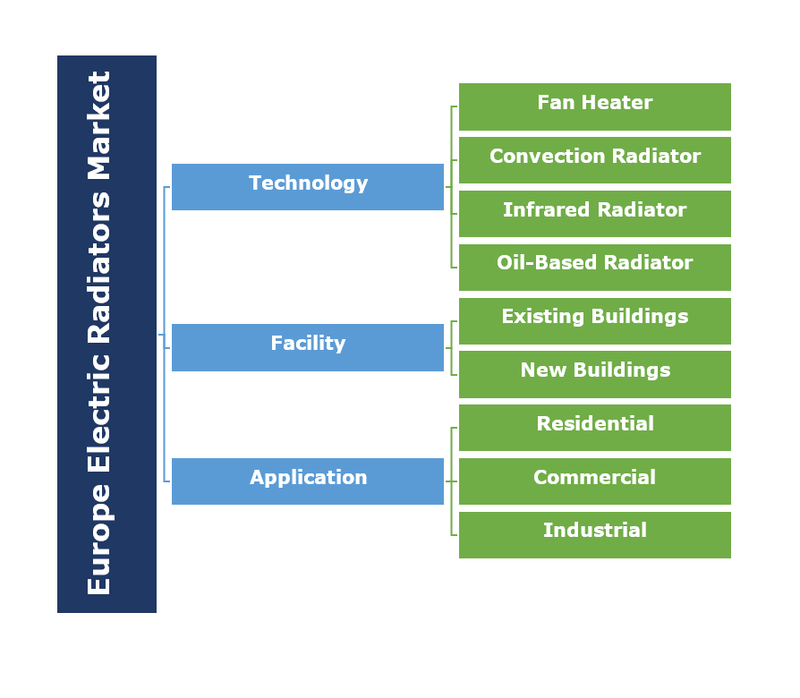 Increasing rate of building energy renovation, rising uptake of net zero operating emissions via system level solution and growing focus toward energy efficiency will positively influence the electric radiators market share in existing buildings. Focus toward development of sustainable buildings along with the growing demand for construction & energy services will boost the product demand. In addition, evolution in consumer behavior coupled with shift in demand for energy conservation with an aim to build 100% net zero carbon buildings by 2050 is set to complement the industry outlook. Residential electric radiators market will grow on account of rapid technological escalation coupled with favorable regulatory regime. Stringent mandates pertaining to the manufacture of space heating technologies will streamline the product adoption. In addition, rise in focus toward reduction of energy bill along with energy saving potential from digitalization will foster the product deployment. Further, urgency to limit CO2 emissions coupled with rising demand for sustainable systems will expand the industry size. Increasing regulatory policies along with growing investments with an aim to obtain energy efficiency will propel the industrial electric radiators market share. Rising focus toward cost-effective techniques to control intensifying energy prices coupled with focus toward zero building emission is projected to complement the business landscape. Implementation of energy efficiency measures including minimum energy performance requirements for the new builds & major refurbishment by the respective governments is further set to encourage the product adoption. UK electric radiators market is anticipated to exceed annual installation of over 300 thousand units by 2025. Rising focus toward low energy bills along with the increasing need to conserve energy from generation to the final consumption at all stages of energy chain is complementing the industry outlook. In 2018 the parliament, the commission and the council agreed on a binding energy efficiency target of 32.5% for the EU for 2030. In addition, it included a clause to revise the target by 2023, positively influencing the business growth rate. Romania electric radiators market is set to witness a considerable growth owing to rising electricity demand coupled with increasing focus toward reduction of carbon emissions. Stringent government protocols along with technological enhancements to improve product features & growing demand for sustainable systems is set to complement the product installation. Major industry players operating in electric radiators market include Jaga, Stelrad, Myson, Haverland, Midea, Eco Volt, Zehnder, Rointe, Eskimo, Dimplex, Technotherm, Aeon, Elnur, The Electric Heating Company, Tubes Radiatori, and Tesy. The manufacturers are participating in M&A’s along with R&D activities to suffice the rising need for reliable and effective space heating technology that will strengthen the industry landscape. Electric radiators are the space heating systems that provide convection and radiant heat. Convection heat warms the air in the room and radiant heat warms up the objects and people directly. The radiators are carbon neutral at the point of use and are associated with renewable or micro-generation energy sources offering electricity to the grid. Growing demand for green technologies along with initiatives toward the enhancement and development of the systems is projected to positively influence the industry landscape.